The AG Hoor operates instrumentation for the measurements of different trace gases. The instruments are based on spectroscopic methods, in particular on absorption spectroscopy in the infrared and UV wavelength range. As a light source either Quantum Cascade Lasers (QCLs) or diode and UV lamps are used. You can find a short description of the individual measurement instruments below. For the simultaneous measurement of the trace gases nitrous oxide (N2O) and carbon monoxide (CO) the Quantum Cascade Laser based spectrometer UMAQS is used. It is based on the “Aerodyne Research Inc.“ Quantum Cascade Laser Mini Monitor which uses an astigmatic multi path Herriot cell with an optical pathlength of 76m. 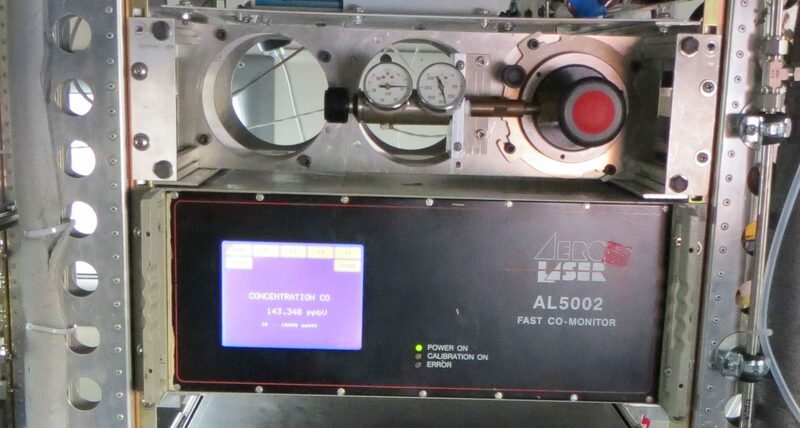 This instrument applies the direct absorption spectroscopy. 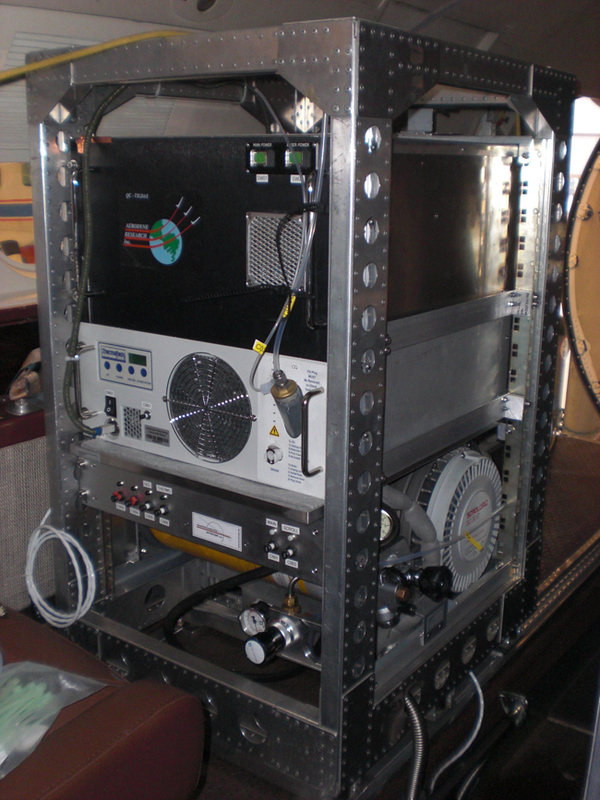 For operating the instrument on airborne platforms the pressure within the measurement cell is controlled at 70 hPa. To account for instrument drifts in-situ calibration on a regular time base during operation are possible. The instrument has a resolution of 1 Hz which is limited by the exchange time of the measurement cell. This allows to measure atmospheric concentrations of N2O with a noise level of 0.08 ppbv (2σ) and a reproducibility of 0.2 ppbv (2σ). For CO measurements the noise level amounts to 0.38 ppbv (2σ) and for the reproducibility we reach 0.7 ppbv (2σ). FABLE is an instrument to measure carbon dioxide (CO2) and water vapour (H2O). 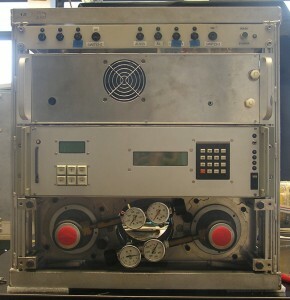 The core instrument unit consists of a commercial NDIR (Non Dispersive Infrared) CO2/H2O Analyzer model LI-6262 of the LI-COR Biosciences company. The concentrations of CO2 and H2O are determined using broad band infrared absorption spectroscopy. Two identical gas cells were used, whereas the reference cell is continuously flushed with known reference gas and the sample cell with the gas that needs to be analyzed. To account for the specific conditions for aircraft operation additional components allow for a stabilization of pressure and temperature in the system. Furthermore, components for in-situ calibrations are integrated. The typical noise level of the FABLE instrument is 0,055ppmv (1σ) at atmospheric concentration levels. The accuracy amounts to 0,3 ppmv (1σ). The LI-7200 is a commercial high precision NDIR (Non Dispersive Infrared) CO2/H2O Analyzer of the LI-COr Biosciences company. 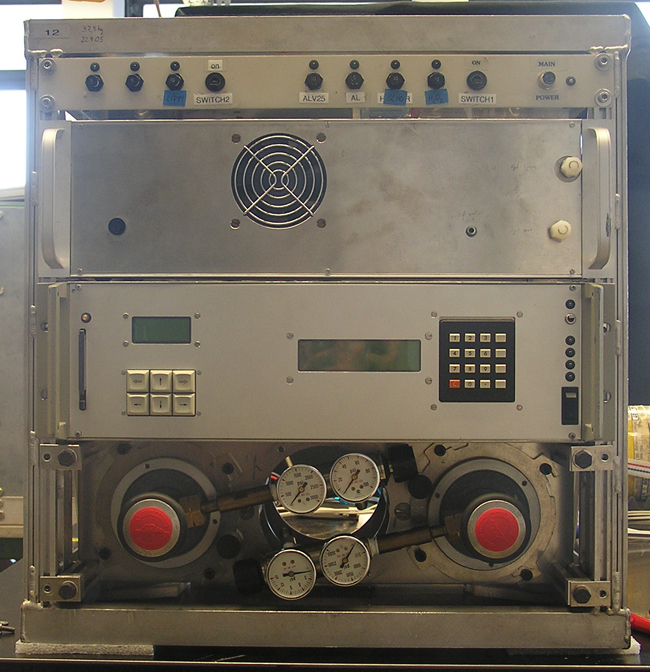 The core instrument unit is a single absorption cell, which allows for a compact system. The instrument enables high resolution measurements up to 20 Hz. During operation the infrared source is guided into the measurement cell and finally on the detector by using a filter wheel and a focusing lense. Optical filters centered at 3.95 µm and 4.26 µm provide reference and absorption signals for CO2, while filters centered at 2.35 µm and 2.59 µm provide reference and absorption signals for water vapor. From the raw signal of the absorption the mixing ratio is calculated. The LI-7200 was modified for aircraft operation. Therefore, a flow control system and components to allow for in-situ calibrations were integrated. The instrument has a very low power consumption of 30 W (without pump) and a total weight of 13 kg. CO2 is measured with a noise level of 0.015 ppmv (1σ) and an accuracy of 0.15 ppmv (1σ). The measurement precision for H2O is ±18.5 ppmv, with an instrument stability of 2.5%. The Aerolaser ultra fast carbon monoxide (CO) monitor model AL 5002 is based on VUV-fluorimetry and uses the excitation of CO at 150nm. UV light stems from a resonance lamp excited by a Radio Frequency (RF) discharge. The selection of the 150nm wavelength is realised by an optical filter, which images the lamp into the RF chamber, where the fluorescence is viewed at a right angle by means of a photomultiplier tube (PMT) with suprasil optics.The optical filter is particularly designed and consists of two CaF2 lenses. The two dielectric mirrors provide the spectral band path (bandwidth of 8 nm full width at half maximum( FWHM) at approximately 150 nm. 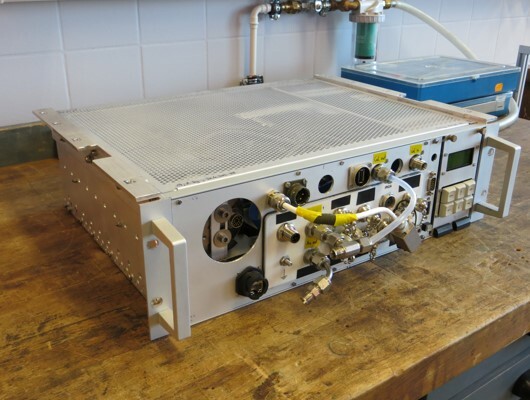 The instrument is modified for applying in-situ calibrations during in-flight operations. The calibrations and zero measurements account for instrument drifts. The CO data achieves a precision of 2 ppbv (1σ) and the stability of the instrument is at 2 ppbv. 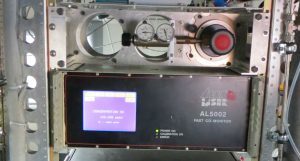 The 2B Technologies Dual Beam Ozone Monitor is designed to enable accurate measurements of atmospheric ozone over a wide dynamic range extending from a limit of detection of 1 ppbv to an upper limit of 100 ppmv based on the well established technique of absorption of ultraviolet light at 254 nm. The ozone molecule has an absorption maximum at 254 nm, coincident with the principal emission wavelength of a low-pressure mercury lamp. Fortunately, few molecules found at significant concentrations in the atmosphere absorb at this wavelength. The Model 205 Dual Beam Ozone Monitor makes use of two detection cells to improve precision, baseline stability, and response time. An air pump draws sample air into the instrument at flow rate of approximately 1.5 L/min. A pair of solenoid valves switch in unison so as to alternately send ozone-scrubbed air and unscrubbed air through the two absorption cells. Thus, the intensity of light passing through ozone scrubbed air (Io) is measured in Cell 1 while the intensity of light pass through unscrubbed air (I) is measured in Cell 2. Every 2 seconds, the solenoid valves switches, changing which cell receives ozone-scrubbed air and which cell receives unscrubbed air. Combined with other improvements, this made it possible to reduce the time between ozone measurements to 2 seconds, making the instrument the fastest UV-based ozone monitor on the market, while still retaining the small size, weight, and power requirements. For 10-s averaging, a precision of 1.0 ppb is achieved.